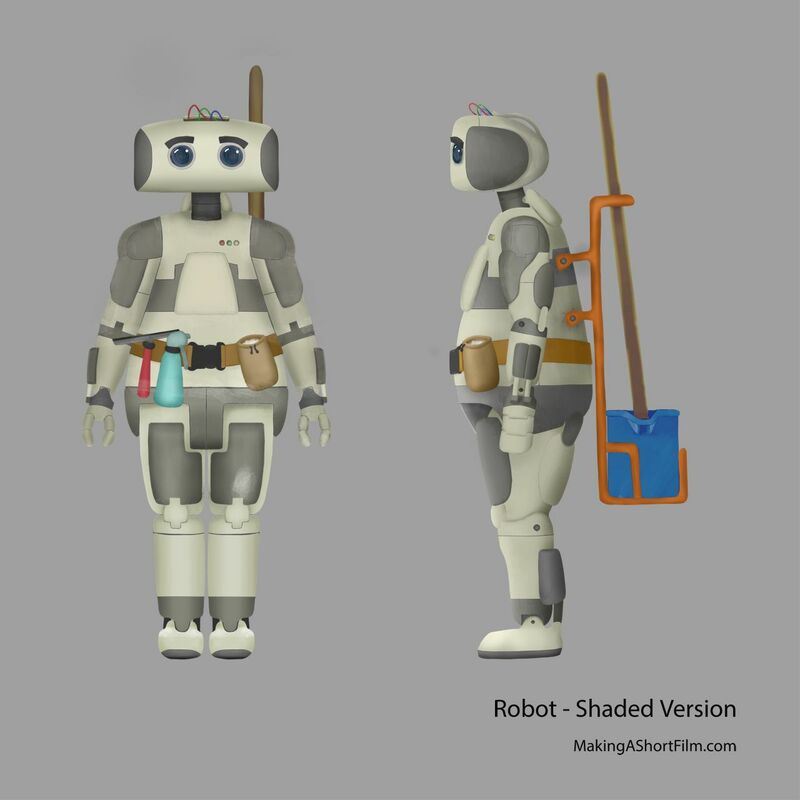 Now the concept art of the Robot is complete as well. The result is visible here up above. I never really understood how far the Robot was from a finished design before I made this version. Previously, it felt like it was basically done, which was very far from the truth. Coloring it revealed the shape much more, and it actually made me split up two of the parts into more pieces so I could give them different colors (on the shin and torso). Other than that I took the opportunity to make some minor adjustments which I wish I had done before. I fixed the hands in the front view, revealing their rounder shape, added the lights on the chest which was missing in the side view, gave the inside of the eyes an actual design and depth, and well as improved the shading a bit. I also added cracks to his back where the mop holder is attached. I want to show how it was just brutally attached to him, essentially breaking him. It really should not be a part of him. If you like the project, please consider following it! I have been thinking quite a bit about how old and damaged the Robot should be. I want him to be a bit old and damaged, so he and the Old Man are somewhat alike, but I still want the Robot to be much younger than the Old Man. I want the Old Man to be helping someone who is young to find himself, not an Old Man helping someone his own age. In this image, the Robot has quite a bit of yellow tint, like old white plastic that has started to color. Since I don't want him to seem especially old, I will probably dial it down a bit on the finished model. Another problem is that yellow makes it look like the Robot works for the hospital, like ambulance personnel or something, and I don't want him to fit at all. However, when it is done in 3D it will hopefully be more clear that it is indeed a bit of aging and not his original color. So, since I want him to look unfit and damaged, but still pretty young, I will focus on the damage aspect more than the wear and tear. I added some scruffs and marks for that (and by design he has a pretty big damage in his head which reveals his "haircut"). The full quality, 4K-resolution version can be viewed in the download section below. Now there is only one thing left before the character concept art is completed, and that is that I will have to design the second outfit for the Old Man, the one he is wearing in his dream. So that is what I will do now. To download the files , you need Premium Updates. Consider getting it and support the production of the film! (It is a one-time fee). 0 Comments	Be the first to comment!